David Bailey rose to fame as a fashion photographer in the early 1960s, his photographs. He published 'David Bailey's box of pin-ups' in 1965 as a loose portfolio of 36 portraits of the mainly-male fashionable elite that, as the cover description states, 'belong to Bailey's own world of fashion, pop music and the Ad Lib [nightclub]'. Each portrait is accompanied by notes by Francis Wyndham. Together, they constitute a celebration of the growing celebrity culture of the Sixties, and many of them have become the definitive images of key figures of cultural life in London during the Swinging Sixties. 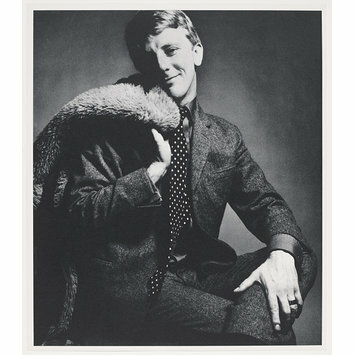 Gerald McCann, pictured here, was a fashion designer. 'He's clean looking, and this has gone into the clothes he designs' say the accompanying notes. 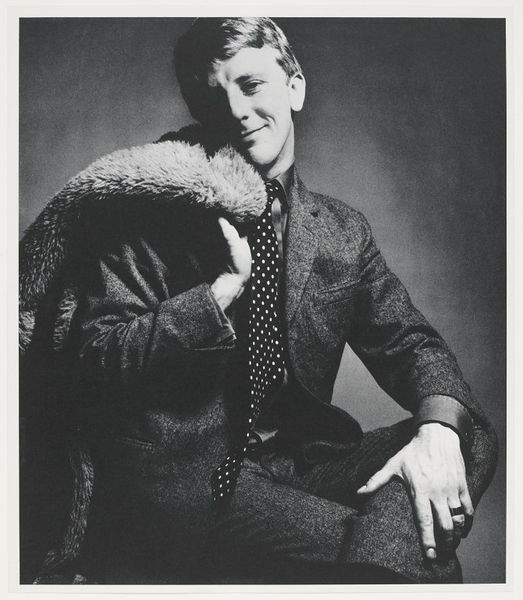 Black and white portrait of designer Gerald McCann, wearing a tweed suit with spotty tie, sitting down with a furry jacket over his shoulder and his legs crossed.